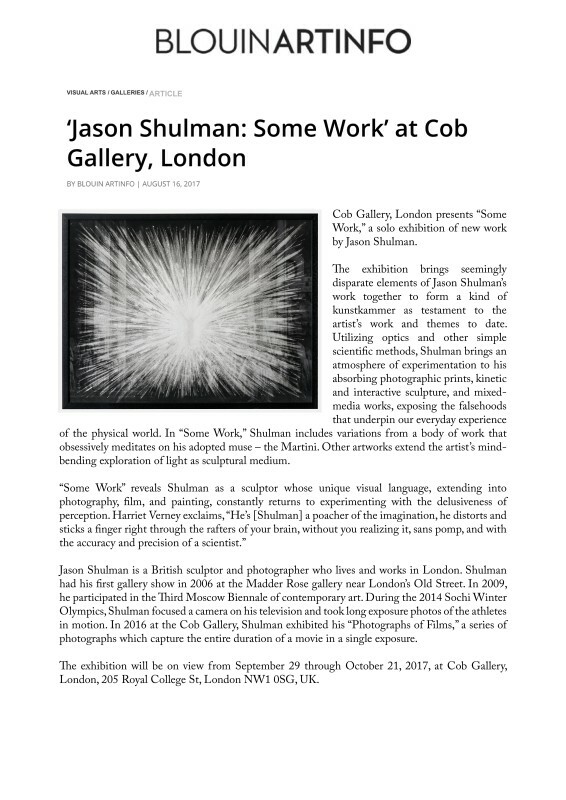 The exhibition brings seemingly disparate elements of Jason Shulman’s work together to form a kind of kunstkammer as testament to the artist’s work and themes to date. Utilizing optics and other simple scientific methods, Shulman brings an atmosphere of experimentation to his absorbing photographic prints, kinetic and interactive sculpture, and mixed-media works, exposing the falsehoods that underpin our everyday experience of the physical world. In “Some Work,” Shulman includes variations from a body of work that obsessively meditates on his adopted muse – the Martini. Other artworks extend the artist’s mind-bending exploration of light as sculptural medium.